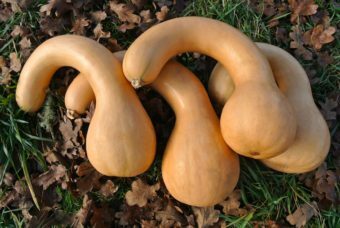 We cannot get enough of this squash. We could eat it nearly every day all winter. A large Honey Boat type with extremely thick flesh and delicious rich flavor. Most delicata have a honey sweet or even maple flavor, but Candystick Dessert delicata has a richer date-like flavor that is truly addictive. Fruit is tan skinned with green stripes, which we find much more attractive than the more common yellow-skinned delicata varieties. Produces both short loaf shapes and long boat shapes. 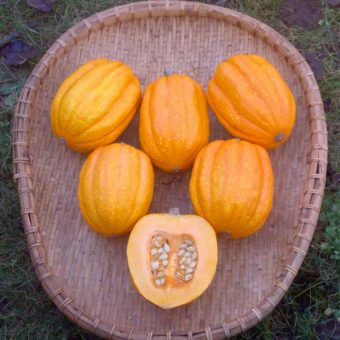 The fruit shape variability is desirable in this instance for genetic diversity and contributes to some added vigor. 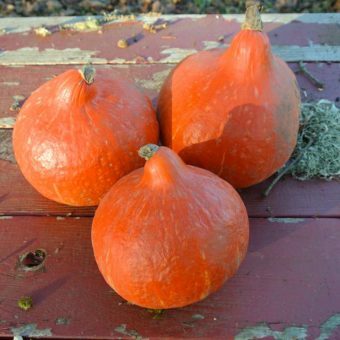 They keep very well and retain their sweetness better than other squash well into storage. 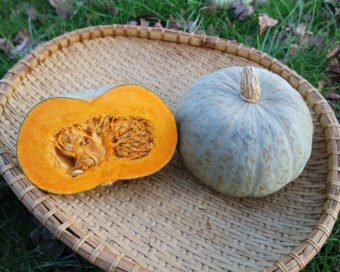 Selected for a small seed cavity – more edible flesh per fruit – so it is not as good for stuffing as Honey Boat. Bred by Carol Deppe of Corvallis, Oregon, author of Breed Your Own Vegetable Varieties and The Resilient Gardener. She has created the ultimate dessert squash.